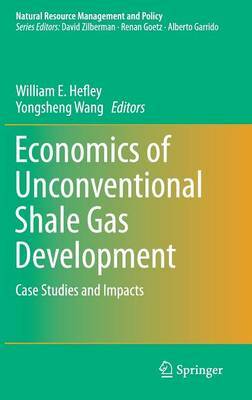 This book examines the economics and related impacts of unconventional shale gas development. While focusing on the Marcellus and Utica Shales in the Mid-Atlantic region, additional insights from other regions are included to provide a broader view of these issues. Shale gas development in recent years has changed the energy discussion in the US, as existing reserves of natural gas coupled with horizontal drilling and hydraulic fracturing make exploitation of these reserves economically feasible. The importance of natural gas is seen as likely to continue to expand over the coming years, and is expected to increase even further with environmental considerations, such as greenhouse gas emissions. Horizontal drilling and hydraulic fracturing producing natural gas from deposits such as the Marcellus Shale is making the US a net producer of natural gas. Previous studies have examined the economic impact of exploration and production in the region. Other studies have addressed legal, environmental, biodiversity, and public health impacts of unconventional shale development. This is the first volume to focus solely on the economics and related financial impacts of this development. This book not only fills the research gap, but also provides information that policy makers and the public need to better understand this pressing issue.